DoFollow Links and NoFollow Links, both are good for your Websites. Ok, ok but tell us what is DoFollow and what is NoFollow links ? noindex, doindex, nofollow, dofollow like some words came in picture when we talk about search engine optimization. It is a pathway for search engine to see the back link and redirect user towards that link. Backlinks are worth full in the success of a blog. Backlinks are also called incoming links, inbound links, inlinks and inwardlinks. If you provide online services then this links will help you to get connected with more peoples, it will also help you for Google page ranking. Nofollow BackLink: Nofollow is an HTML attribute value. This value is used to instruct search engines that a hyperlink should not influence the link target’s ranking in the search engine’s index. If you are linking to any website which is not of high value then use rel=”nofollow” attribute in your html of the webpage. DoFollow BackLink: DoFollow is also an HTML attribute value. This value is used to instruct search engines that a hyperlink should influence the link target’s ranking in the search engine’s index to reach up to desired website. Google still counts NoFollow links as outgoing links for distribution of page ranks. Wikipedia nofollows all their external links now. For Word Press blog, you can use Robots Meta plugin to put HTML attributes in a post or complete site. You’re able to add more HTML to the code above in order to tell the search engine spiders whether or not you want them to follow the link towards your site. How I can check is link DoFollow or NoFollow ? 1. Do Left click and scroll over the link. 2. Then right click on the link and then click inspect element. First 3 Steps are same as above. 5. You will get to know the link is DoFollow or nofollow type. Where to use NoFollow links? 1) In your blog’s comment section, ‘Untrusted Content’. If you are using blog then it is better to give nofollow to the outgoing links in a blog. For the content relevant links only you should use DoFollow links. Every site has links that are less important or link to pages that don’t change (e.g., About Me page, Location Map). Use the NoFollow tag for those links. It is better to have a mixture of both nofollow and dofollow links. 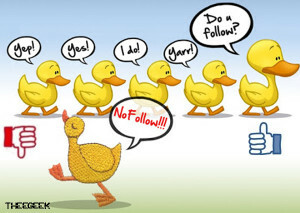 Remember it is up to you whether you want to give nofollow some consideration in your link building. That’s all for today ! !